In a large pot bring some salted water to a boil. Add the farfalle pasta and cook uncovered over high heat, al dente, according to package directions. While the pasta is cooking, heat olive oil in a large saute pan over medium heat. Add the garlic and cook for 30 seconds to 1 minute. Add the squash, red pepper and salt. Cook until squash starts to soften, around 6-8 minutes. When pasta is done, reserve 1/2 cup of the pasta water, then drain the pasta. Add the pasta, Parmagiano-Reggiano cheese, half of the chopped basil and the reserved cooking water to the pan with the squash. Stir together over the heat until well combined. Transfer the pasta to serving plates. Sprinkle with remaining basil and serve. Simple, quick and kid-friendly -- just the meal I need now that the kids are back in school and we're back to routine! My kids just started school this week (can we get a hallelujah?) and now that we are back to the grind I need healthy, fast meals that my whole family will eat. Pasta is always a winner with my crew so this Pasta with Yellow Squash was gobbled down in no time. 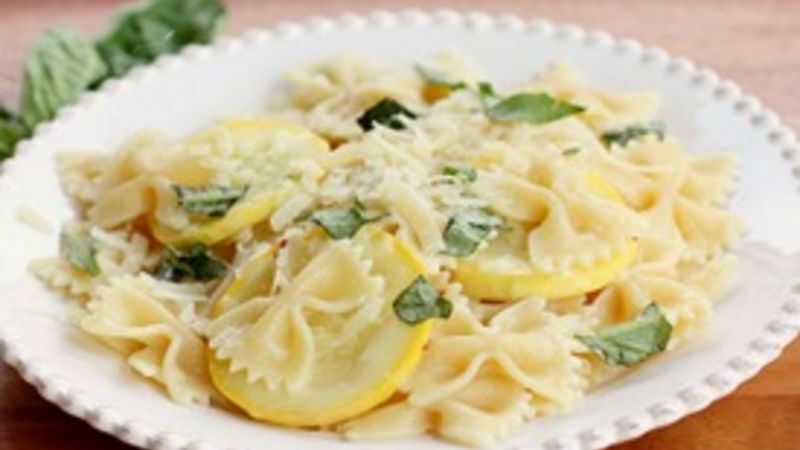 Farfalle pasta is tossed with some fresh yellow squash, garlic, basil and Parmigano-Reggiano for a light, no-fuss meal that can be on the table from start to finish in less than twenty minutes. With the hectic schedules of sports and homework that’s exactly what I need. Let me state for the record that I do not have a garden. I have whatever the opposite of a green thumb is. A black thumb maybe? I’ve been told that you can grow anything in Florida, but this Florida girl right here has proven that wrong. So until I figure out how to not kill all living things, I will continue to make this pasta with the fresh and inexpensive squash from my local grocery store. But if you’ve been blessed with the skills to maintain a garden, definitely take advantage of using the fresh squash and basil from your own garden. The best meals are the simplest ones that let the natural flavors speak for themselves. Enjoy this easy and affordable meal! More? Sure ... here you go! Try this No-Pressure Pasta Dinners recipe collection! Christy joined the Tablespoon team to share her recipes and inspire family food fun. Watch her Tablespoon member profile for great new recipes! What's your favorite way to use garden squash?